For the last several weeks, people of the Horn of Africa, have been engaged in debates about new bold ideas of reform presented by the new populist, energetic leader of Ethiopia Abiy Ahmed. The new premier has embarked on (1) a wide-ranging transformative economic and political reform in Ethiopia and (2) a regional integration initiative in the Horn of Africa region. The former part attracted both praise and criticism. (See Ethiopia’s Prime Minister Shows Knack for Balancing Reform and Continuity, Can Ethiopia’s Reforms Succeed?, and Ethiopia: climbing Mount Uncertainty). It is the later part of the proposal – the idea of a regional economic integration – that has not yet fully been scrutinized. The following paragraphs discuss Abiy Ahmed’s vision for the region, the pace with which the premier thrusts his vision and the reality in the region. To the prime minister’s credit, the region needs new fresh ideas. Indeed, some form of economic coordination can facilitate economic growth and political stability in the region. It is quite plausible that some form of economic coordination, may pave the way for a gradual slow rapprochement over the next 40 years or so. On the other hand, attempting a quick implementation of a full-fledged political integration will only produce grave risks to the stability of the region by exasperating the existing ethnic tensions, especially if such attempts proceed with the current hurried pace. This is certain because there are serious political and practical problems with the idea of political integration in the Horn of Africa. A region mired by conflict, social unrest and distrust amongst the inhabitants. There are also contentious technical issues that require unambiguous determination prior the formulation of any regional integration. Questions remain today, about how equitable are the stakeholders engaged in the process? What kind of economic or trading bloc? and how to create an impartial common space for economic and political action for the parties concerned? An equitable participation in formulating these policies and designing the future of the region is crucial for successful regional economic cooperation. It is worth noting that economic literature on Africa’s economic integration informs us that countries in the region failed to realize economic integration partially because of political issues, rivalry, state-society relations, questions of sovereignty, exclusionary policies, and parochial interests. It is therefore unclear if and how Abiy Ahmed’s enthusiasm alone can single-handedly overcome these long-standing serious challenges. Yes! the region needs some form of economic grouping, to compete globally, and, yes, there are many possible arrangements to aspire solidarity, cooperation in the region, but the last thing the region needs is a hasty process and uncertain future brought about by ill-conceived vision and mandates signed by inequitable entities. It is also surprising that Abiy Ahmed’s initiative excludes Kenya from the proposed economic integration in the region. Kenya is politically the most stable and economically most advanced in the region, excluding Kenya makes no rational sense (economically and politically). Moreover, it is not clear why should the region introduce a new initiative outside – the Intergovernmental Authority for Development – IGAD’s Pillar 2 strategic objectives, especially one that excludes Kenya the region’s economic powerhouse. The exclusion of IGAD countries from the current initiative and the furious pace of this may plunge the region into a disastrous region-wide conflict in which ethnic groups engage perpetual competition for dominance and/or survival. This is not implausible in a region that is characterized by ethnic narratives and trust-deficit. 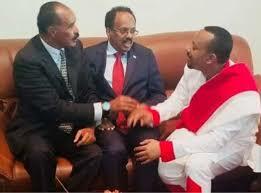 There are already claims that the current initiative is an Oromo driven plan to dominate the region and annex of the former Somalia (including Puntland, and Somaliland), Djibouti, and Eritrea to form a Greater Ethiopia. A dangerous narrative! For sure, yet, the underlying apprehension is reasonable given the transitive nature of power and Byzantine politics in the region! Finally, economic integration is a long ardent process that culminates in collectively accepted and complete harmonization of economic policies. It is not an instrument for a shock therapy or is it a one-shot cure-all solution for all the region’s economic problems. An economic integration requires, staged, careful, long-term deliberative process. Participants and stakeholder need to thoughtfully weigh up technical issues – from designing rules for factor integration to systems of supranational enforcement. It took Western Europe nearly 50-years to actualize the European Union (EU) – a process that continues! It is therefore utmost important to question the diligence of Abiy Ahmed’s initiative in its current format. All concerned parties/countries should question if the proposed initiative is trustworthy, if it can lead to an equitable arrangement for the people in the Horn of Africa region. Do ask what is the rush for anyways? Abdul Ahmed is a Wardheer News contributor, the president and founder of Strategy and Operations Group and former employee of International Financial Institutions (IFIs) in Washington DC.